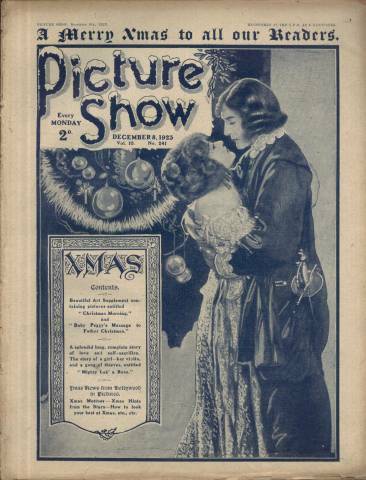 Originally published by The Amalgamated Press beginning in 1919, Picture Show Magazine, a British publication, was then issued by Odham's Press from the early 1930's through 1960. 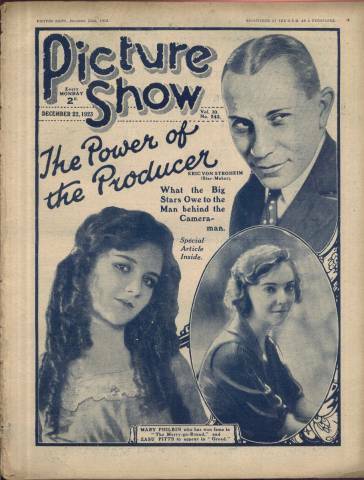 Picture Show merged with Film Pictorial Magazine in 1939. Despite its British origins, Picture Show dedicated much of its space to American films and stars. This page shows the covers and includes the contents of a number of issues I had acquired in 2005. They all range between November 1923 through March 1924. 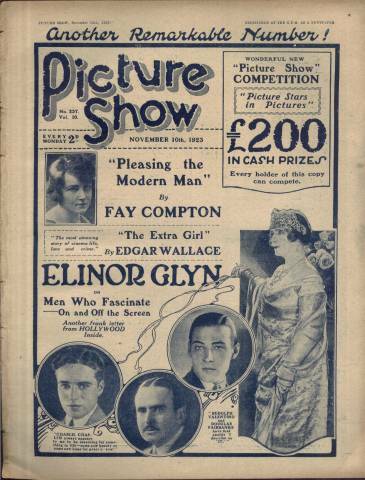 During this period Picture Show Magazine was 24 pages, printed on newsprint and registered as a newspaper. 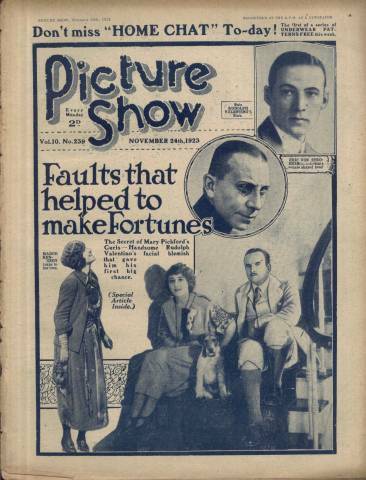 Bare bones, one-color, these early issues of Picture Show did offer one frill inside; the Art Supplement. The Picture Show Art Supplement was printed on a slightly higher quality paper -- almost slick in appearance compared to the rest of the flat issue. 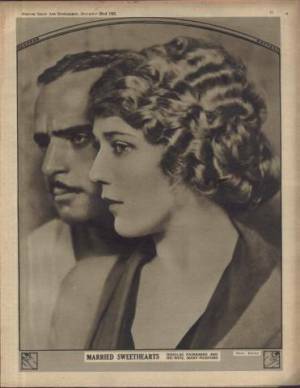 The Art Supplement was found in the middle of the issue, easily removed and thus scarce, and usually featured one or two portraits along with several smaller scene photos from a recent film release. 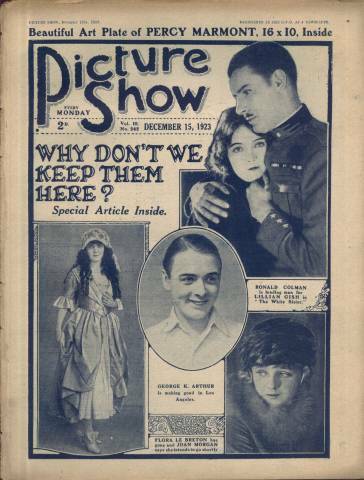 "Picture Show Chat" has a photo of Theodore Roberts as Moses in "The Ten Commandments"
Page 10 and 15 (which are the center of the issue because of the missing supplement) includes "Pleasing the Modern Man" by Fay Compton with photo, and at the bottom of the page 4 photos of Anna Q. Nilsson getting her hair cut for "Ponjola"
"Elinor Glyn's Letters from Hollywood" has photos of Charlie Chaplin directing Carl Miller, Edna Purviance with Adolphe Menjou in "A Woman of Paris"
"Striking Scenes from this Week's Picture Plays" is one page of photos including: Dorothy Gish and Richard Barthelmess in "Fury", Enid Bennett and Willard Mack in "Your Friend and Mine", Katherine MacDonald in "The Woman's Side", Wesley Barry in "Heroes of the Street", Clara Kimball Young in "Cordelia the Magnificent", Gladys Walton in "The Guttersnipe", and Betty Compson, Bert Lytell and Theodore Kosloff in "To Have and To Hold"
Art Supplement: Single page shows Owen Nares and Gladys Jennings, 2-pages in center titled "New British Productions," last single page also consists of "New British Productions"
"Doug's Son" has a half-page photo of 13-year-old Douglas Fairbanks Jr.
Art Supplement: Single page shows Reginald Denny with wife and daughter on Christmas morning, 2-pages in center titled "Baby Peggy's Message to Santa Claus," last single page is titled "Striking Scenes from this Week's Picture Plays" and includes several smaller pics: Gladys Walton in "The Love Letter", Pola Negri in "Mad Love", Agnes Ayres and Richard Dix in "Racing Hearts", John Gilbert, Carmel Myers and William Lawrence in "The Love Gambler", Milton Sills, Anna Q. Nilsson and Frank Campeau in "The Isle of Lost Ships", and Kenneth Harlan and Colleen Moore in "April Showers"
Short Story: "Mighty Lak' a Rose"
"Gossip about British Players" is a single page that includes small pics of Isobel Elsom, Gerlad Ames, Ivor Novello, Ben Field, and some film scenes. 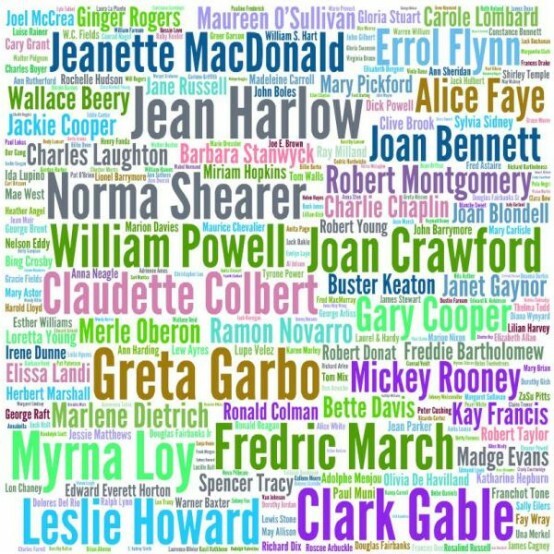 "Gossip About British Players" includes small pics of George K. Arthur, Nina Vanna, Bunty Fosse, Cecil Hepworth, and a slightly larger shot of Carlyle Blackwell in "The Beloved Vagabond"
Short Story: "Her Social Value"